Singing insects produce sounds in a variety of ways. Members of the order Orthoptera typically create sounds by “stridulation,” which is the rubbing of one body part against another. Among crickets and katydids, the base of the forewings are specially modified for sound production (see the image to the right). A sharp edge or “scraper” is located on the upper surface of the lower wing and is rubbed against a row of bumps known as the “file” on the underside of the upper wing. Sounds produced in this fashion range from melodic trills or chirps of crickets to the high-pitched raspy squawks, buzzes, and shuffles of katydids and grasshoppers. Singing postures of a field cricket, a tree cricket, and a meadow katydid. During sound production, crickets and katydids elevate their wings and then move them back and forth rapidly. The wings vibrate as a result of the scraper rubbing against the file and setting the wings in motion. Among field and ground crickets, the wings are held above the body at a moderate angle with the wings spread slightly to the sides. The tree crickets hold their wings nearly vertically above their bodies while singing. Katydids barely elevate their wings, just raising them enough above their bodies so that the wings can vibrate. I actually went doxycycline 100 mg 7 days back and forth on this one and.. Although our native grasshoppers (Acrididae) do not stridulate with their wings, many do stridulate using their hind legs against the closed wings. Short peg-like bumps on the inside of their hind femurs function something like the file, the edge of the closed wing acts as the scraper. They can only produce sound on the downward motion of the leg against the wing as the pegs would snag on the edge of the wing on up stroke. Singing males can be recognized by the rapid up-and-down motion of their hind legs, one going up while the other is going down. Sounds produced in this fashion are quite and shuffling in quality. Band-winged grasshoppers may also “crepitate” in flight by snapping their wings taught or clapping their wings together over their bodies creating a crackling or buzzing sound. In contrast to the Orthopterans, male Cicadas have a pair of special sound-producing organs or “tymbals” located on the sides of the basal abdominal segment, just behind their wings. The contraction of muscles causes ribs in the tymbal to bend suddenly producing sounds that resonate within the large tracheal air sac within the abdomen. 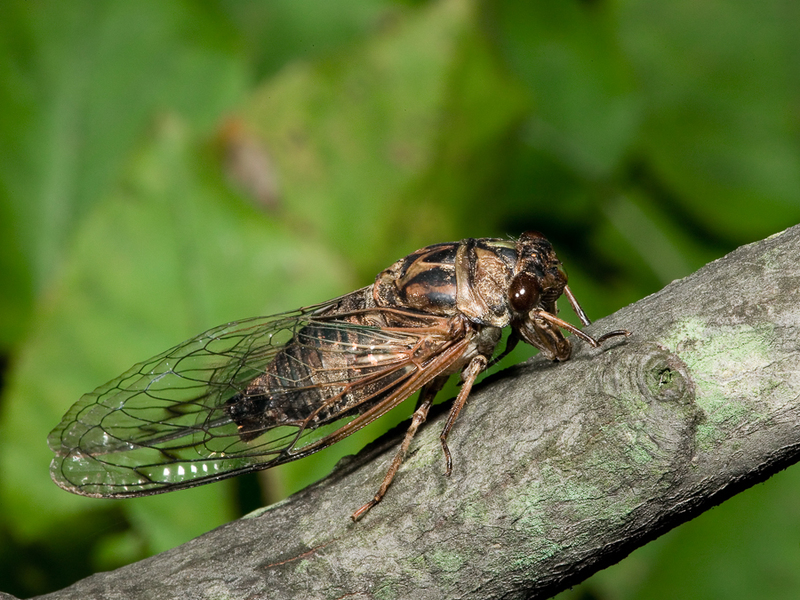 Cicadas produce the loudest of insect sounds, far surpassing the volume and range of Orthopteran singers. 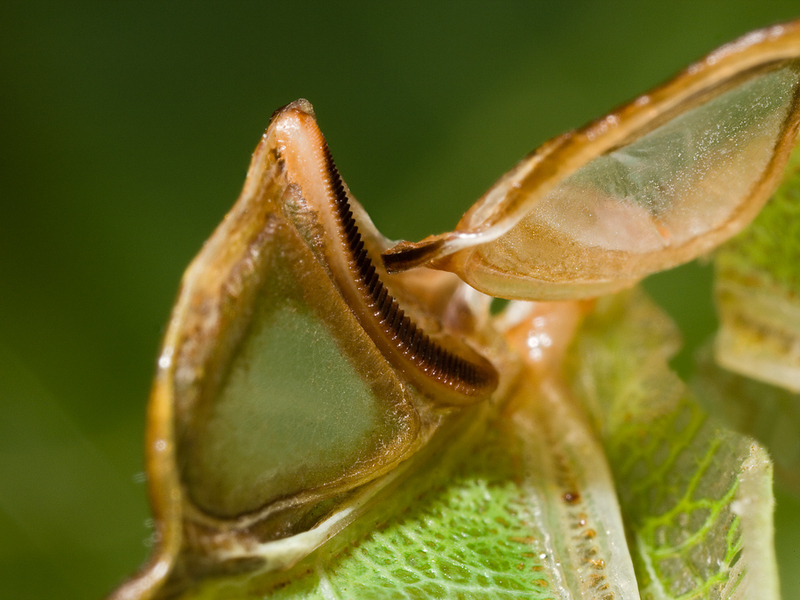 The singing Orthopterans possess oval eardrums, or tympana, which are characterized by a localized thinning of the cuticle at the site of the hearing organ. 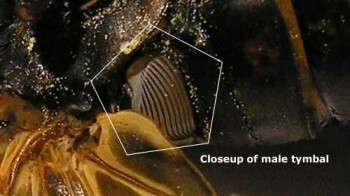 Crickets and katydids have tympana located on the front legs at the base of the tibia (white arrows in image to left). Locusts have tympana covered by the wings and located on the sides of the first abdominal segment. Cicadas have exposed eardrums located on their abdomen next to their tymbals. You would think that cicadas would deafen themselves producing such loud sounds right next to their ears. As it turns out, just as the male cicada starts to sing, he contracts a small muscle that folds the ear shut. Certainly, an ingenious way to protect his hearing. In general, the tympana of singing insects are relatively insensitive to changes in pitch but are very sensitive to changes in the intensity of the sounds being received. This corresponds to the basic structure of most insect songs, which rely more on variations in timing than on changes in pitch. Most insect songs fall within the frequency range of 2,000 Hz to 15,000 Hz and beyond (Hz = cycles per second). Crickets generally produce musical trills or chirps that fall on a definite pitch that is usually below 10,000 Hz. A trill is defined as a continuous train of notes or pulses given too fast to count and usually lasting several seconds or more. A chirp is a very short burst of notes (a very short trill lasting a fraction of a second), usually given in a series, with each chirp being followed by a brief period of silence. 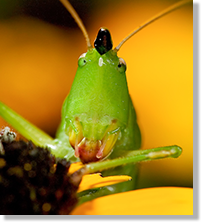 Katydids and grasshoppers alike have high-pitched songs that contain a wide band of frequencies, with emphasis often falling above 10,000 Hz. Many are nearly or quite inaudible, especially if the listener has high-frequency hearing loss. Their songs are variously described as being noiselike and composed of atonal shuffles, rattles, scrapes, swishes, buzzes, or ticks, depending on the species. Some species, such as many of the meadow katydids, sing more or less continuously. Others, such as a number of the false katydids, sing intermittently, with long periods of silence between singing bouts. Cicada are known for their loud and penetrating songs. Most fall below 10,000 Hz and are variously described as rattling buzzes or harsh trills, and they often have a pulsating or grinding quality. In many species, song starts slowly, builds to a crescendo, and then finally drops off at the end. Each species has its own distinct song, which is recognized by all individuals of the same species. Songs are told apart both by their dominant frequency and by the details of their timing patterns. It is important to note, however, that singing insects are cold-blooded and that the pulse-rates of their songs vary with temperature. Songs tend to speed up as the temperature rises, and slow down as the temperature falls. Thus, the song of each species must be defined with respect to the ambient temperature. Insects are not at all confused by this. Apparently, as the temperature of an insect changes, so does its “idea” of what determines its own species’ song. In other words, its notion of the proper pulse-rate of the song of its species rises proportionally with a rise in temperature, and drops proportionally with a drop in temperature. Because of this effect, the songs of certain species can actually be used to approximate the temperature. A well-known example is the Snowy Tree Cricket. An early researcher determined that counting the number of chirps given in 13 seconds and then adding 40 gives a close approximation to the actual temperature in degrees Fahrenheit. Likewise, similar formulas can be determined for a variety of species of singing insects. The song of a Snowy Tree Cricket. First at 55F then at 73F. Tompkins Co., New York. ©Lang Elliott. The great majority of insect songs that we hear in nature are the “calling songs” of males, produced primarily to attract mates. Calling songs may have other functions as well. In some species, the calling song may serve to attract males to a group chorus whose combined sounds attract females to the area (this occurs among many cicadas). Alternatively, the mating song may function to keep males optimally dispersed within singing colonies (this occurs among many meadow katydids, coneheads, and cicadas). Males of certain species, especially field crickets, also have special “courtship songs,” which are given in the presence of a female. These often sound similar to the calling song, but with obvious changes in the timing. For instance, in the Spring and Fall Field Crickets, the calling song is a measured series of repeated chirps, while the courtship song is a sputtering ramble of rapidly delivered notes. Fall Field Cricket calling song followed by courtship song. Various locations and dates. ©Wil Hershberger. Some species also give “aggressive sounds,” made when two males encounter one another. Field crickets are a good example. Certain species may also respond with “disturbance calls” when handled. For instance, Common True Katydids may give loud raspy calls when touched, and many cicadas respond with rattling squawks. At least among cicadas, one individual giving a disturbance call may cause other nearby individuals to quit singing and fly away. 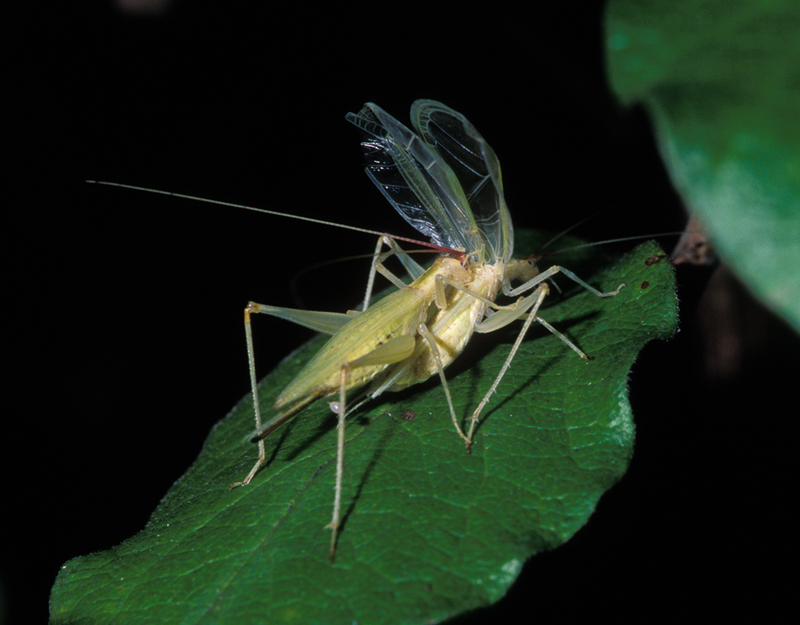 Female calling is rare among Orthopterans and Cicadas, but there are cases in which females respond with special calls to the calling songs of the males. For instance, in the Greater Angle-wing, females often follow the male’s song with a sharp tick. Similarly, female cicada of many species may respond to a nearby male with a sharp snap, produced by shuffling their wings. Among most of our singing insects, the male attracts a female by singing his calling song. When he becomes aware of her approach, he either stops singing altogether or else he switches to a special “courtship song” that further engages the female. In crickets and katydids, it is not uncommon for the male to vibrate his body at this point, a behavior known as “tremulation,” which helps the female orient herself for mating. The male not only offers the female a sperm packet (spermatophore), but he also may offer her a “nutritional gift” intended for consumption during mating. 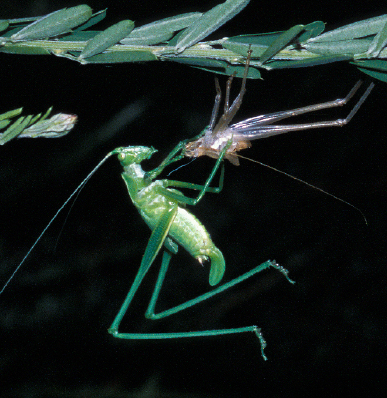 In mating Broad-winged Tree Crickets, the female will climbed on top of the male (this is the case for most crickets) and will spend some time feeding on secretions from glands on his back, as he prepares to transfer a spermatophore from the tip of his tail to her tail (see photograph on left). In katydids, the sequence is often different, but the outcome is the same. For example, the male may approach the female from behind and clasp her abdomen. In the photograph, to the right, of mating Fork-tailed Bush Katydids, the male on the left is transferring a spermatophore to the female on the right. The glob is comprised of his sperm packet plus a much larger edible gelatinous mass (the spermtaophylax) that she will eat once the male has disengaged. Cicadas follow a similar pattern, but they often fly about in search of females. In Linnaeus’ 17-year Cicada, the courtship sequence is complex. In his search for a female within dense congregations of other calling males, the male flies from perch to perch, calling from each location for short periods. If a receptive female is nearby, she responds to his song by flicking her wings to make a high-pitched snap or tick. Upon hearing this sound, the male begins singing a special courtship song that elicits more ticks and guides him to the female. Finally, he mounts his mate and begins singing yet a third song type as the pair join to accomplish sperm transfer. As with crickets and katydids, pairs separate after copulation, and males are able to mate with other females that they encounter during the breeding period. In all the singing insects, mated females immediately begin searching for good places to lay their eggs. In crickets and katydids, eggs are laid either in the soil or in plant tissues. Grasshoppers (locusts) usually lay their eggs in the soil, while most cicadas lay their eggs in the woody stems of trees and shrubs. ￼￼ In nearly all species of crickets, katydids, and grasshoppers, the eggs do not hatch until spring, when young nymphs emerge that feed, grow, and shed their skin as they pass through five or more instar stages before becoming sexually mature adults (see photograph to right). This is why we don’t hear many singing insects until the last half of the summer. Some species, such as the Spring Field Cricket, may overwinter as nymphs, and there are cases in which adults survive the winter, especially in the southern states. Cicada eggs typically hatch in late summer or early autumn. The nymphs fall to the ground and burrow into the earth, where they subsist on roots for several years as they pass through their instar stages. Just before becoming adults, they emerge from the ground, crawl up tree trunks, and then shed their last skin. Nymphal skins are easy to find in areas where cicadas are common. A number of species tend to form singing aggregations, in which males group together within appropriate habitat. Various cicadas exhibit this behavior. For example, it has been shown that male Linnaeus’ 17-year Cicadas are attracted to one another’s calls and hence form dense choruses. 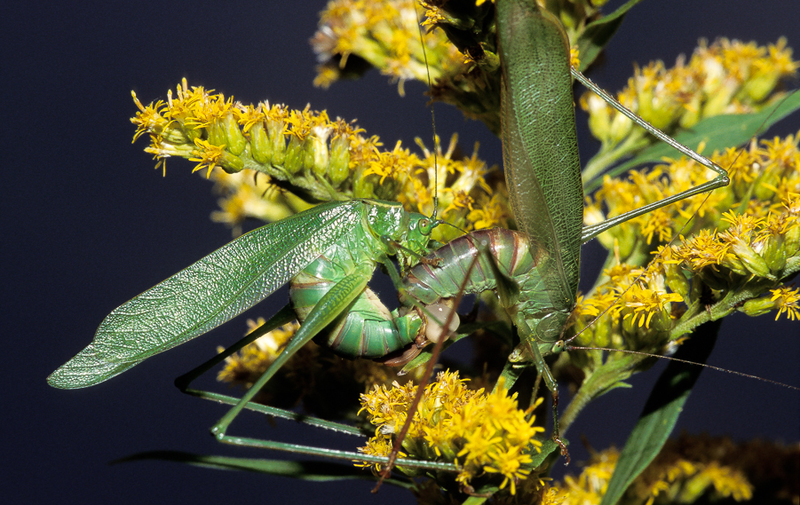 Certain meadow katydids also tend to occur in colonies, but males are usually well spaced within a colony. Such aggregations could be the result of habitat preferences but often consist of more individuals than one might expect based on habitat quality alone. Within colonies, calling often has contagious elements. For instance, the first male to begin singing in a group often elicits singing in other males. This is particularly noticeable among certain bush katydids. In the Broad-winged Bush Katydid, individual males give their song sequence intermittently, with several minutes of silence in between. In this species, there is a marked tendency for males in a colony to sound off in a loosely coordinated sequence. When one male begins singing, another follows, then another, and so forth. Singing insects may also synchronize their songs. For instance, in the Common Meadow Katydid, the song is composed of a series of ticks followed by a buzz. Individuals in dense colonies often synchronize their songs so that they are all ticking together and then buzzing together. Likewise, neighboring male Snowy Tree Crickets often sing in unison, and it is not uncommon to find a number of males chirping together in almost perfect synchrony. Synchrony also occurs in Nebraska and Slightly Musical Coneheads. In the Columbian Trig, males in colonies call together but synchronize imperfectly, to create a unique throbbing sound. A synchronized chorus of Columbian Trigs in a Crape Myrtle. September 5, 2002. Somerset Co., MD. ©Lang Elliott. A complicated example of alternation and synchrony occurs in the Common True Katydid. Neighboring males tend to alternate their calls. But when a large number of katydids are close enough to react to one another, the result is a combination of alternation and synchrony in which each male is alternating with the neighbor he hears most clearly, but is at the same time synchronized with other males who are alternating with the same neighbor. The result is a huge pulsing soundscape that is rather amazing to behold. Below is a sampling of the sounds that various singing insects make. Click on the play button of each player to hear the sound. http://songsofinsects.com/wp-content/uploads/insect_musicians_tinkling_ground_cricket.mp3Crickets, ground crickets, tree crickets, trigs, and mole crickets produce pure-toned songs such as this example of a Tinkling Ground Cricket singing. http://songsofinsects.com/wp-content/uploads/insect_musicians_common_meadow_katydid.mp3Meadow katydids lisp, trill, and shuffle. Here is an example of the Common Meadow Katydid. He sounds to some like a lawn sprinkler. http://songsofinsects.com/wp-content/uploads/insect_musicians_common_true_katydid_northern.mp3The Common True Katydid ratchets out his loud song from forests at night. http://songsofinsects.com/wp-content/uploads/insect_musicians_rattler_round-winged_katydid_male1.mp3The false katydids sing more quietly. Their quiet lisps and shuffles are similar to these from a Rattler Round-winged Katydid. http://songsofinsects.com/wp-content/uploads/insect_musicians_carolina_grasshopper.mp3The grasshoppers or locusts can make loud crackling sounds, while flying, like these of the Carolina Grasshopper. http://songsofinsects.com/wp-content/uploads/insect_musicians_scissor-grinder_cicada.mp3Cicadas are the loudest of the singing insects. Here is the loud, pulsating song of the wide-spread Scissor-grinder Cicada.